Our extensive grounds include 3 water features, 27 trees, dozens of native plants and many herbs, all planted to attract native butterflies, hummingbirds and a variety of birds. There are 15 off-street parking spaces for tenants and their guest. 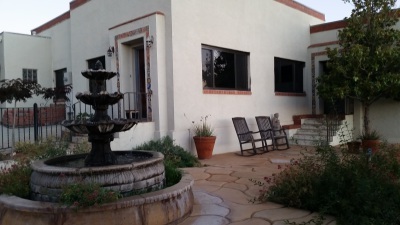 Tierra Alta is a boutique apartment complex located 8 blocks from downtown Silver City. Our backyard is over 600 acres of open space, “Boston Hill” which is owned by the Town of Silver City with 7 miles of trails for hiking and biking. The “Spring Street” trail head is on our property. 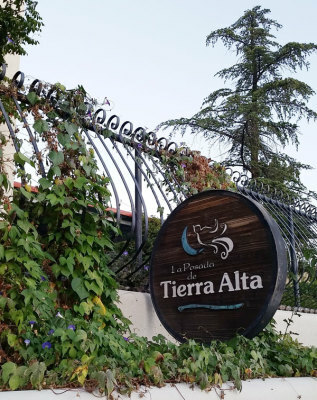 Tierra Alta is about 1 acre in size with 7000 sq.ft. of housing, 2 buildings, a large courtyard dominated by the 80 year old almond tree, 35 feet of elevational change and 111 steps. Your time here should improve your health. When finished we will have 5 one bedroom apartments, one studio and the main house. Every apartment has direct access to outdoor tables and chairs, an extension of your living space to enjoy your breakfast or happy hour. Our extensive grounds include 3 water features, 27 trees, dozens of native plants and many herbs. There are 15 off-street parking spaces for tenants and their guest. City services, natural gas and electric included in the monthly rental price. Telephone, TV services and internet are paid by the tenant. All apartments are wired with cat-5 wire and RG-6 back to a central location for “Century Link”, Comcast and/or satellite dish or antenna for broadcast TV. There are 4 locked storage areas downstairs in the back building, they are 4.5’ wide X 7’ tall X 21’ long they are included in the monthly rental price. The water in your dwelling is softened, water softeners are maintained by the landlord. There is a coin operated washer and dryer on site with lockers to store your laundry needs. Upon signing the contract you must pay one months rent plus an equal damage deposit. Rent is due on or before your beginning date, we accept check or credit card. Two vehicles maximum per apartment. All vehicles must be operational. Two people maximum per apartment. Your guest may stay in the studio apartment if it is available. 1 person is $30.00 per night and 2 people is $40.00 per night. Studio apartment has queen size bed, broadcast TV and breakfast lunch kitchen.